Sequels are hard. They are hard to do with movies. Writing a series of books is, in my opinion, rarely successful. I have to say that Shattered Destiny was a success. It was filled with such great characters. The plot was a living thing. I have never read something that followed so well. Shay West has outdone herself here.The chosen are now traveling to learn about each others' cultures. This book ... I rarely devour books like I did this. Well done. 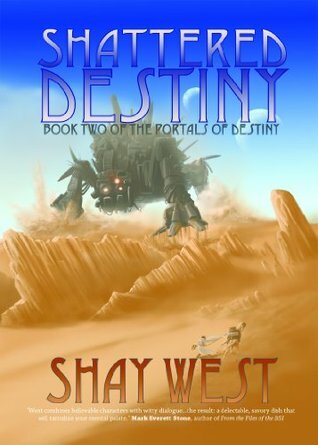 Before I started "Shattered Destiny", the 2nd book in the Portals of Destiny Series (by Shay Fabbro), I actually reread the last chapter of "The Chosen" (which I reviewed just a few days ago). I did this for a few reasons, chiefly because the ending was a major cliff-hanger that I didn't quite see coming.The other main reason for rereading the last chapter of "The Chosen" before moving on to "Shattered Destiny" was that I wanted to get strong grip on the magic those words held and ride them as I crashed into the continuation of the story.Second books always have it hard, particularly if they are like "Shattered Destiny" and are a follow-up to such a break out hit.I had extremely high expectations going into the book - I wanted the words that took hold of me in book one to yank me again with such force I would be breathless. I was not disappointed. Shay showed us such diverse worlds (Earth, Astra, Volgon, Kromin, Gentra) in the first book - she takes that introduction one step further and gets at the core of her characters in book two. The story line in "Shattered Destiny" is no less complex and rich than in "The Chosen" - the words simply paint a much darker corner of the story. Walking with the Chosen left as they find their path was surreal - I was cheering, loving, hating, disgusted; by the end tears freely poured down my heated cheeks. While the ending of the book (I hadn't been paying attention to the progress meter on my kindle fire) did not quite sneak up on me like the ending in "The Chosen" did - it was no less intense, in fact it was much more intense and left me feeling emotionally raw.Having now read 3 books by author Shay Fabbro ("Dangerous Reflections", "The Chosen" and "Shattered Destiny") my applause for her skill - as an author, for her willingness to take stories in unexpected directions, for her delicacy in handling sensitive themes - only grows louder which each thought of her epic books.If you haven't had a chance to read any of her books yet, I strongly encourage you to get off your duff and get them - dance your fingers over to amazon if you can't bring yourself to shake the cobwebs from your tired bones, the minute you read about Alexis Davenport, the Earthlings, the Volgons, the Kromins, the Gentrans and the Astrans you will feel literary gold coursing through you veins. Shattered Destiny is the second book in the Portals of Destiny series. In the first book, we were introduced to four sets of Chosen ones. Each set of individuals came from a different world bringing very unique talents into the mix. Those from Astra had the use of magic. The Earth Chosen were warriors and protectors used to the elements. The Volgon Chosen had technological advanced weapons. The clones from Kromin connected to everyone using telepathy. A prophecy tied these very different beings together as the only hope not only for their own planets but for others as well. Now, in the second book, the Chosen begin their battle against Mekans. The first planet attacked is Astra. With little technology or weaponry, this planet truly doesn’t have a chance against the attack. The Chosen must now come together as a group, using all of their combined skills and resources. Will it be enough though? After all, these are four groups of very different beings stepping onto an alien planet with no clue how to take down these indestructible machines. In Shattered Destiny, the four sets of Chosen attempt to become one cohesive group. It’s not an easy task, getting to know each other and respecting the different points of view. Then, at each step along the way, these individuals have to cope with new bodies and a whole new set of rules. Unfortunately, time isn’t their ally and even the tiniest delay might mean the end of a civilization. I very much enjoyed the first book in this series. I really wondered what the author would do with this huge cast of very different characters with so very much at stake. Shattered Destiny was even better than I hoped it might be. Very fast paced and filled with action yet woven seamlessly within were these meaningful complexities that happen when very different people are thrown together in do or die situations. Hello Readers! I was given this book, for free, by the author herself in exchange for an honest review. I have to ask her, seriously, who does she think she is, Joss Whedon or Steven Moffat? Come On!!!!! (fellow nerd/geeks will totally get that reference by the end of this book...others, look those guys up, they are awesome, lol) First off, I am glad that I read "The Mad Lord Lucian" between book one and two. There were a few references to it in this that made it easier to understand. If you haven't read that one yet, I recommend that you go back and read that before this, it will help. Now I have to tell you that this was this was an action packed adventure! The Chosen get to Gentra and learn more of their fate through the prophecies. From there, they, and their Guardians, travel to the other Chosen's home worlds to learn more about each other. Then things take a turn when the Mekans start arriving on some of their planets and...well...get hooked like I did and you will find out. Shay does a great job of being descriptive, but not overly descriptive, about how the characters look/act on each planet. I could feel the intensity at the end because I honestly didn't know what would happen. The cliffhanger of the last chapter...um...yeah, book three, here I come! With this book, I could envision this series being made into a 13 episode mini-series on SyFy or BBCAmerica. Bring it on "Resigned Fate"! I am ready with my box of tissues! Continuing where the first book ended, the Chosen find themselves on their fellow Chosen’s home worlds to better understand each other. The interactions prove to be more than any of them bargained for as they’re forced to earn each other’s respect. As they’re forced to face their private issues and desperate times on their home worlds, the group has a simple choice: Come together or let the universe die.In many ways this is a classic coming of age story and the various growing pains one expects, but it’s so much more. The forced integration helps to break down the barriers each one feels as they’re forced to come to terms with their own views on what makes a person useful and worthy. The characters keep the story flowing as my favorite group, the Volgons, prove to be the most entertaining when they take human form. This may just be because she’s my favorite, but I thought the depth the author showed with Gwen made her stand out. As a fan of the underdogs, I enjoy watching someone that’s different or with an handicap overcome it in some way. Book 2 of The Chosen “Shattered Destiny” holds up and exceeds the expectations set forth by the first book. We go with the Chosen to other worlds, and the responses of the characters definitely fit in with the normal range of human(oid) reactions. There are those that will give up everything for a greater good, those that only want to go home and for everything to go back to the way it was before, the one’s that are hoping to redeem themselves and every reaction in between. The Prophets have lost their voices, the Mekans are already landing, guides are lost and more of the Chosen are killed. The characters get cold, dirty, hungry and learn to work together. A great hope is shown to be false and the darkness beckons. Even with all this, fear and respect grow, while love has a chance to bloom. "Brok stood, his face contorted with rage. He advanced on Gerok and Forka. “This is your fault! What were you thinking?” Brok screamed, his voice echoing across the square. He covered his eyes, as if he could shut out what he had witnessed.“We are not to blame…”Brok turned to face them and the two snapped their mouths shut. “You are to blame. And Mirka as well. Our duties are to protect the Chosen! Our lives mean nothing!” His gesture took in all three of them. “Your foolish rescue has cost us the lives of four of the Chosen. FOUR!” Brok’s voice broke as a sob escaped him.We are doomed. "Different from the first, but good. I was given a copy of this book to review by the author. This book continues where the first left off and it has a darker feel to it. Everything that can go wrong...does. There is plenty of action and fleshing out of characters as well as some surprises. I am sure there will be a re-emerging of the villain. 'One chosen dead in the first book, making their plans to save the four worlds from the deadly Mekans just a little harder. Who could expect the trials and tribulations the Chosen must face as they travel between worlds, trying to find a way to save their worlds. Well done, Ms. Fabbro. I received this book in return for an honest review.Will write proper review when I have finished the book. I thought it was would hard to top the intensity and emotion of Book One (The Chosen), but she did it! I found myself lost in the story and living through the characters. I laughed, I cried. Brilliant.